Being a pet parent is never easy. You have to look after the needs of your dog from food to healthcare to playtime and exercise and even socialization activities. It is like having a new baby in the family who is very dependent on your care and attention. While there are now plenty of products in the market that can help us in the performance of our roles as pet parents, choosing the best of each kind can be daunting. This is where dog subscription boxes can help. Organized specifically to help pet parents provide most of the essential things that canines need – treats, interactive dog toys, chews, treatments, fashion accessories, dog grooming, and even dog training – these dog subscription boxes are always viewed as heaven-sent by pet parents who are simply too busy or are not really well-versed about what’s best for their hounds. 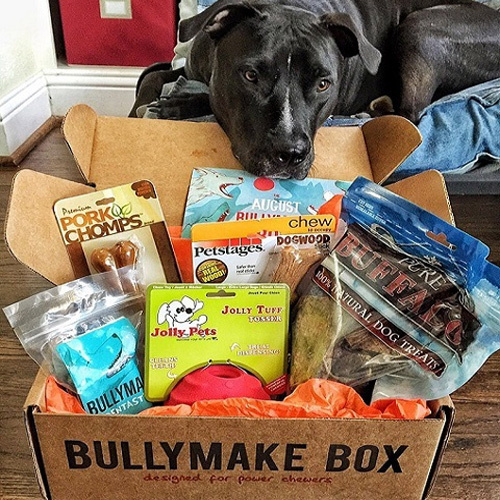 So, if you’re like these pet parents or you simply love the idea of having a gift box to open for your dog every single month, then check out our 20 best dog subscription boxes. It’s going to be worth it. Bark Box is one of the leading dog subscription box services currently available today. Each interactive and innovative toy, delicious and nutritious treat, and durable chew is carefully selected according to your subscription plan. All products that are included in the box are made from either the US or Canada so you’ll have greater peace of mind regarding the quality and safety of the goodies included in the selection. 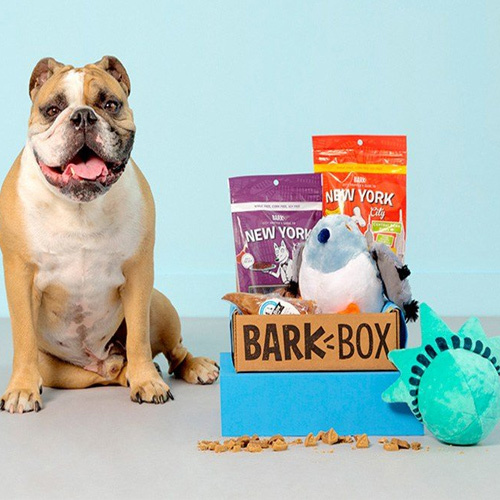 Perhaps what is really enticing to many pet parents is the fact that Bark Box comes up with monthly themes to keep their subscribers and their respective dogs interested and yearn for more. They also ship the very first subscription box immediately regardless of the day that you first subscribed. Succeeding shipments are always done every 15th. Thankfully, the company has been spot-on when it comes to its every-15th day shipment policy. One of the things pet parents about Pup Joy is the ability to customize what they want their subscription boxes to contain. From the kind of treats to the type of toy, you get to choose what your dog will be receiving. They also have items for power chewers so that’s one less of a problem to think about. Pup Joy provides 2 kinds of boxes, Uno and Grande containing 5 and 7 items, respectively. The Uno box contains 2 standard bags of doggie treats with limited ingredients, a piece of all-natural dog chew, and 2 pieces of artisan-quality dog toys. The Grande adds a dog chew and a treat. 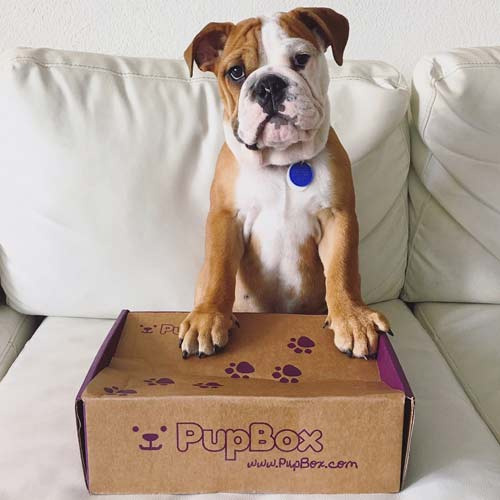 Subscription plans start at $39 per box delivered on a monthly basis, although majority of pet parents prefer getting the 12-box annual subscription plan with recurring monthly fees of only $33. Pup Joy prides itself of its top-rating Pet Care Innovation recognition for 2018. Pooch Perks bases its subscription packages on the size of your dog, although they have a Mixed Size plan. The premium-quality, USA-made doggie toys, treats, and other goodies are, thus commensurate to the size of your dog so you’ll feel safer knowing that your pet will not be in danger of choking on items that are relatively small for its size. Pooch Perks also allows for 3 modes of billing: monthly, bi-monthly, and quarterly. Pet parents are strongly encouraged to secure a longer-term subscription plan of at least 3 months to enjoy as much as 15% discount. The shipment of the subscription box doesn’t follow a definite schedule, except that it is shipped a week upon placing the order. 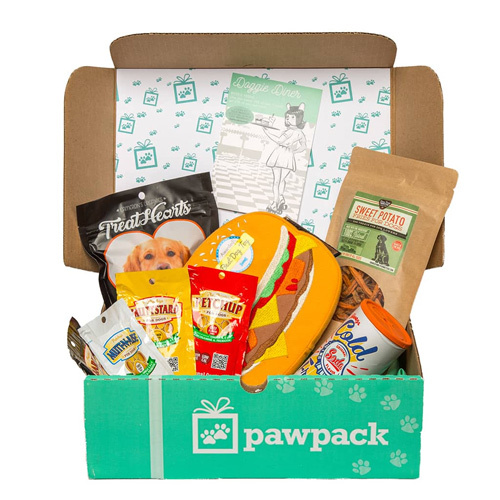 The company’s Sample Pooch box is interesting since it provides pet parents of the chance to give to their dogs 2 items from the company’s boxes from the previous month. 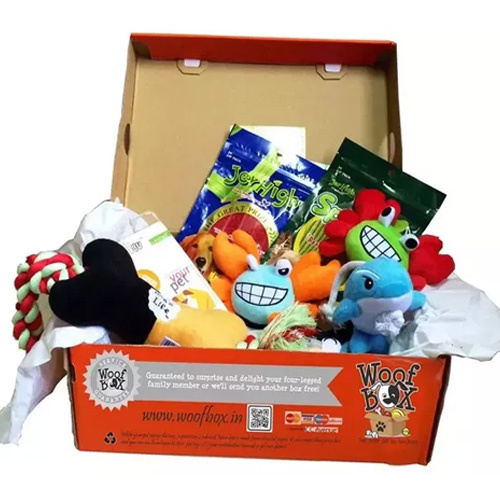 The main advantage of The Gift Box is that you not only get to choose the best gift your pet will be receiving on a monthly basis, you will also get the chance to give yourself or someone else in your family or circle of friends a gift box. There are 3 gift boxes that are specific for dogs. Should you decide to give a gift box for dad, then the Fishing Giftbox is great. For mommy, there’s the Mom Giftbox. For the sweet-tooth in your family, there’s the Sweets Giftbox. And if you decide to give one for the whole family to enjoy, The Gift Box’s Escape Giftbox is a great choice. You can choose to receive any type of gift box every month or you can stick with your original plan. They also provide free gifts to bloggers who can write reviews for them. The only downside is that shipping generally takes 2 weeks from the date of order. Succeeding shipments are depending on the holiday theme for the month. 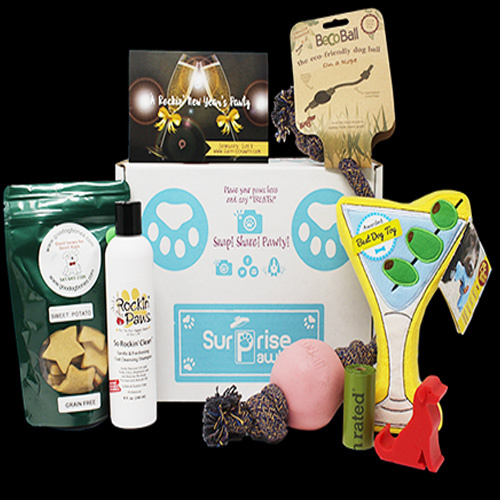 Free box for pet bloggers The main advantage of The Gift Box is that you not only get to choose the best gift your pet will be receiving on a monthly basis, you will also get the chance to give yourself or someone else in your family or circle of friends a gift box. There are 3 gift boxes that are specific for dogs. Should you decide to give a gift box for dad, then the Fishing Giftbox is great. For mommy, there’s the Mom Giftbox. For the sweet-tooth in your family, there’s the Sweets Giftbox. And if you decide to give one for the whole family to enjoy, The Gift Box’s Escape Giftbox is a great choice. You can choose to receive any type of gift box every month or you can stick with your original plan. They also provide free gifts to bloggers who can write reviews for them. The only downside is that shipping generally takes 2 weeks from the date of order. Succeeding shipments are depending on the holiday theme for the month. The dog subscription box service of Pet Treater is very straightforward. There are no plans to choose from, only a monthly subscription that is fixed at $24.99 guaranteeing you monthly receipt of premium-quality toys, treats, and accessories for your hound, shipped every 10th day of the month. While it does not have quarterly or even annual subscription plans, it does provide limited-offer discounts for initial orders. As of this writing, they provide a $20 off on the first month of subscription before reverting to its usual monthly rate. The company doesn’t accept cancelations, refunds, or returns for orders that are already shipped. You can cancel your subscription anytime, though. 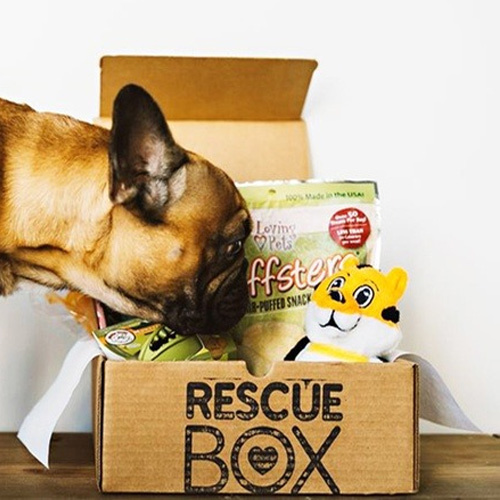 From doggie treat-lovers to formidable chewers, Rescue Box handpicks every item that they put into their gift boxes for your pet. What is very interesting is that every subscription plan has a corresponding benefit to animals in shelters, providing much-needed vaccinations and high-quality dog food. All of the edible items that are included in the gift boxes are sourced from the US and Canada. No edible products are brought in from China. The only downside with Rescue Box is that you cannot customize the contents of your box. So you’ll just have to trust them to give your pet the best surprise of its life on a monthly basis. The cancellation of subscription is easy, too. And the best part of such action is that you still get to receive the remaining gift boxes of your subscription plan. For instance, if you opted for a 6-month plan and you decided to cancel your subscription after the 3rd month, you still get the gifts for the remaining 3 months. 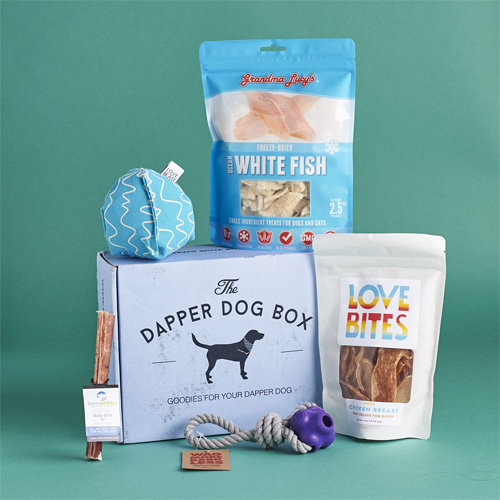 Pet parents who are looking for grain-free dog treats for the grain-free dog food-fed pets, The Dapper Box provides an excellent selection of healthy surprise treats for dogs. Each item is carefully chosen to meet the unique characteristics of your hound, ensuring excellent quality every time. Unlike other dog subscription box services, The Dapper Box prides itself of truly unique items that are never the same with each box. This helps eliminate familiarity and boredom and to keep your pet interested every time you open a gift box from Dapper every month. They also have premium chews formulated specifically for heavy chewers as well as other notable items that any breed of dog will love. One of the best things about Pup Box is that it is primarily geared for puppies. This is more like a platform that is solely dedicated to the normal growth and development of babies – of dogs, of course. 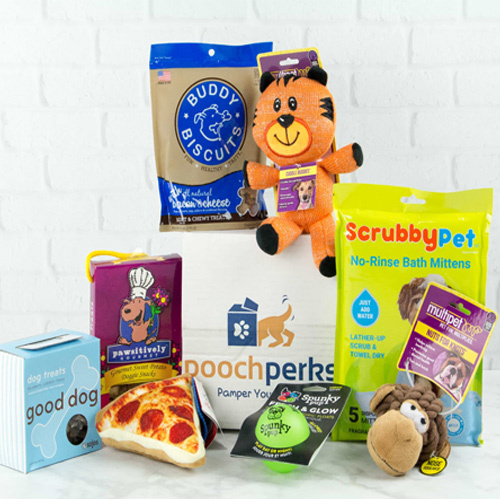 Pup Box provides the usual gift box items including life stage-appropriate toys, treats, chews, and accessories, but more puppy-focused. What is commendable is their emphasis on puppy training from housetraining to early socialization, toddlerhood, exercise and grooming, and adolescent dog coping. The tips and tricks are highly specific for one’s dog as Pup Box requires certain information about your dog’s age, gender, size, and coat type. Sadly, they don’t have breed-related information which should really personalize the gift items. But then again, getting all the right training guides plus the puppy-appropriate goodies is better than the usual goodies-only dog subscription boxes. 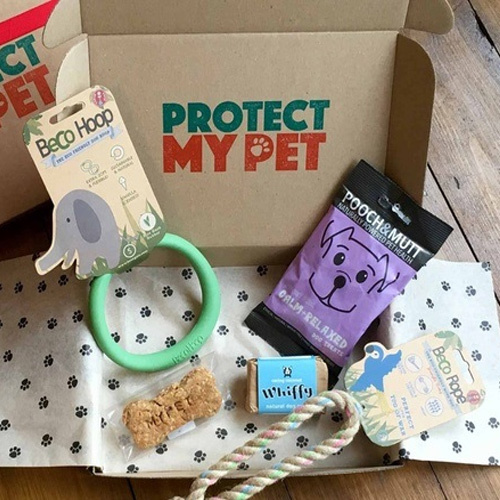 Protect My Pet is a different kind of dog subscription box service. If conventional providers offer the usual doggie treats, toys, chews, accessories, and what-have-you, Protect My Pet is more focused on giving your pet the ultimate protection against fleas and worms. Each month, PMP ships flea treatments with your choice of Frontline or Advantage for the flea treatment and Drontal for dewormer. Of course, Protect My Pet also has the Plus version of its subscription box. This contains doggie treats and poo bags in addition to the flea and worm treatments. 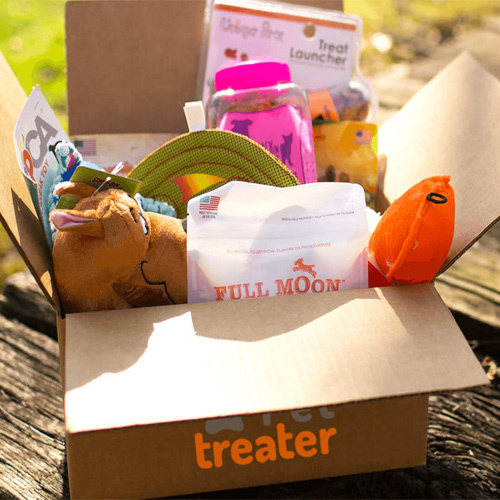 If you don’t want the treatments, then you can always opt for the Gift Box which contains a variety of goodies for your hound including toys, treats, chews, and accessories. The treatments are tailored to the age, weight, and breed of your pet so you can bet your dog will have the best protection. The other good news is that you don’t need to worry about missing a monthly dose anymore. 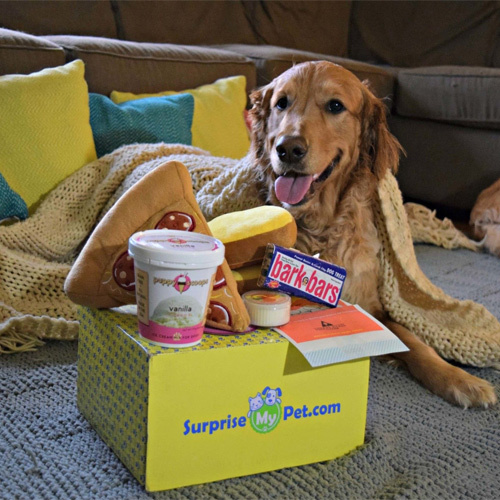 Surprise My Pet is a dog subscription service that offers affordable plans, giving your dog access to 5 to 7 premium quality items such as delicious treats and innovative toys on a monthly basis. All boxes are shipped every 24th day of the month. Unfortunately, free shipping is only available in the US. A portion of each membership subscription is earmarked for supporting charitable organizations. The feeling of being able to help another dog should be very rewarding to pet parents. Of course, their own hounds will also be delighted to receive their gift boxes every month. The problem with the chews and toys that other dog subscription boxes provide is that they are not really that tough especially when presented to a power chewer. If you’ve got a hound that can literally turn a toy into shreds within minutes, then you’ll need the expertly-crafted products of Bullymake. The company offers a 14-day durability guarantee; if the chew toy that was sent to you is unable to last 2 weeks because of the indomitable chewing spirit of your pet canine, then you’ll have all the right to ask for a replacement. Giving such a guarantee is virtually unheard of. At least, they are not claiming that the products they put in every box are indestructible. Each month you’ll receive 2 to 3 chew toys that are extremely tough even for your tenacious power chewer in addition to 3 to 4 nutritious and yummy doggie treats. Pet parents know the value of giving treats to their dogs. These bite-sized pieces of edible doggie food are invaluable when it comes to positively reinforcing those behaviors that we desire from our pets. And while our favorite pet shops can provide us with a steady supply of doggie treats, we are almost always treated to the same kind every time. This has seriously got to change. Getting a monthly subscription with Treat Luv gives you the chance to give to your dog high-quality, organic, American-made doggie treats that your pooch will definitely love. 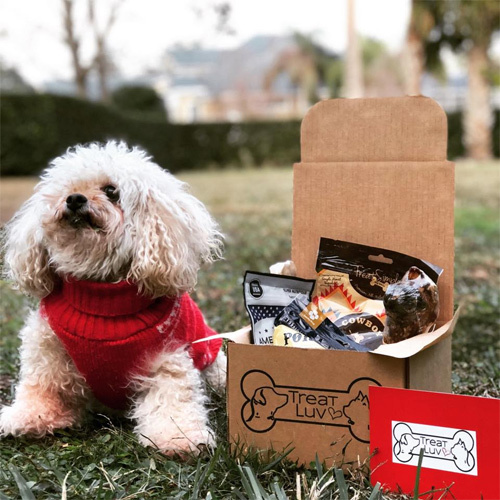 There’s no need to go to your pet shop to buy the same treat every single time as Treat Luv delivers different high-quality treats every 12th day of the month. The greatest thing is that you’ll be essentially giving your pet different treats every month. And if you subscribe for longer-term plans, you’ll be saving as much as $6 than if you do it on a monthly basis. If you’re after really tasty, healthy, and safe doggie treats you can put your trust in Treat Luv. From doggie plush toys to squeaker toys and even Classic KONG to delicious and nutritious doggie treats and really-tough chews, Woof Pack has them all. 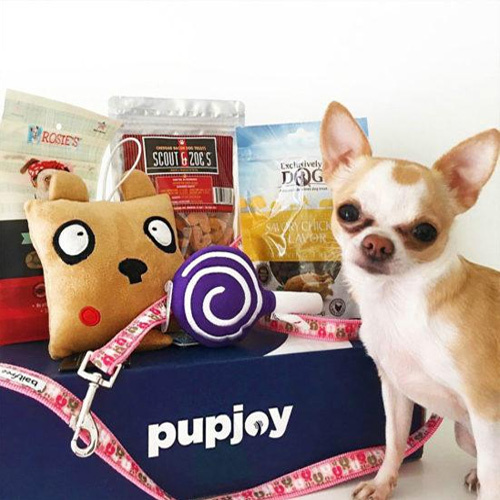 The company provides one of the most inexpensive dog subscription box plans in the market today, making it an appealing prospect for pet parents who are not yet ready to invest several tens of dollars on pet items on a monthly basis. Each item that eventually ends in the gift box is selected to match the characteristics of your dog. Unfortunately, Woof Pack only considers the size of your dog and doesn’t take into account other factors that may play in the determination of appropriate dog products. Nevertheless, you can always start with a Treats and Chews Only gift box to give it a try. If you love what you see, then the Toys, Treats, and Chews gift box should be perfect. 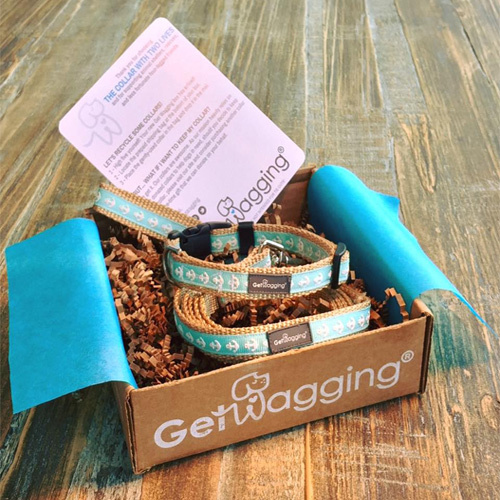 The beauty of being a member of Get Wagging is that your pet will be able to sport a different kind of collar every month. The best part of it is that the old, used collar can be sent back to Get Wagging to be given away to dogs in animal shelters as well as others that may be in need of such contraptions. The company provides a prepaid return packaging for such a purpose alone. There are two Get Wagging choices – a collar-only option and one that is a collar-and-leash combination. The collars are available in Martingale or standard types as well as for either male or female dogs. With these customizations, you can bet that your dog will have something really fashionable and hip around its neck every month. Purple Bone is not really a dedicated dog subscription box platform. Instead, it is an online shop for dog products and accessories that can include doggie fashion, harnesses, treats, toys, bowls, beddings, grooming, and a whole lot more. One can think of their subscription service as a way to entice pet parents in the UK and the rest of the world to check out the various products that they have in store for man’s best friend. 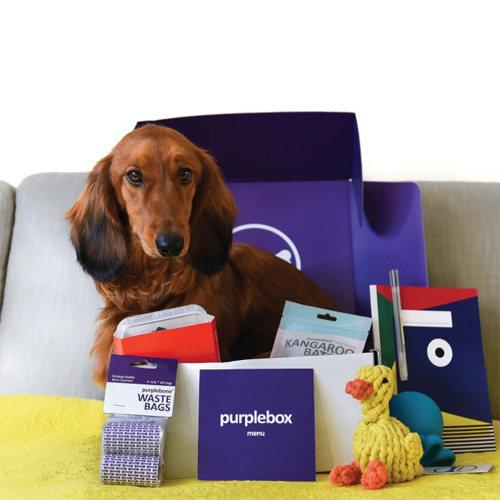 Purple Bone offers the usual stuff that is now common among dog subscription packages including treats, accessories, and dog toys. Perhaps what it does provide that many don’t offer is a host of dog cosmetics and waste bags for your pet. Purple Bone also offers a chance to get for your dog their previous month’s gift box selections. This means you still get to give to your dog something that you may have missed in the past. Do take note that free shipping is only available in the UK. While Surprise Pawty doesn’t provide free shipping even to the US and Canada, it does makes up for it by providing pet parents an interesting array of innovative doggie products that many may have never seen before, much less use. All products are guaranteed to be safe for your pet and edible items are healthy and nutritious as well. Each box contains a smorgasbord items that will have your canine pawing on your door the moment the delivery man arrives with its monthly package. Treats are certified all-natural and organic and are sourced only from credible facilities in the US. The doggie toys are designed for full interactive potential as well as durability. Surprise Pawty currently has an ongoing promotion whereby new members get to enjoy a 6% discount when they choose the 3-month prepaid plan. There is only one subscription plan available on Bark If You Want Some, covering 12 months. It does come with a single-month, one-time purchase but this hardly qualifies as a subscription. Nevertheless, what is interesting with Bark If You Want Some is that you get to choose from 4 different box themes: beauty, sports, holiday, and Star Wars. You also get to choose a different kind of box theme from your original every 3 months. For instance, if you initially selected the Beauty Box plan and want to try the Sports Box gift items, you can do so for the next quarter. Most pet parents choose to try out all 4 different box themes in a year to give variety to the surprises they give to their pets. If any, your dog will also be receiving a bag of treats every other month if you choose. 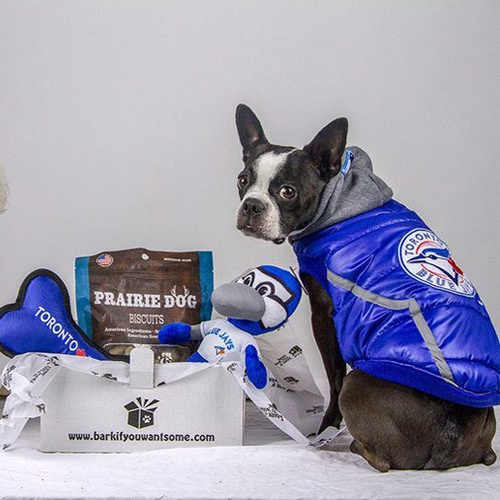 Wigglebutt Box is a dog subscription service that takes into consideration your dog’s size and chewing habits to help them curate the best possible set of items to send to you every month. The company also has one of the most inexpensive plans in the market today, allowing pet parents to enjoy as much as $125 in savings if they get the longer-term plans. Each box contains high-quality, grain-free edibles that are sourced from reputable organizations in the USA, Canada, New Zealand, and Australia. Since they also factor-in the chewing habits of dogs one can always feel safer that the toys and other goodies can withstand the chewing personalities of individual hounds. 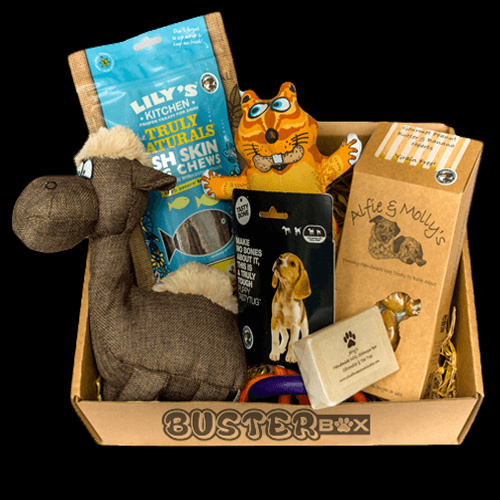 Pet parents in the European continent, but most especially in the British Isles, can take pleasure in the fact that BusterBox is there to serve yummy and nutritious treats, interactive and fun toys, and cool accessories every 15th of the month right at their doorsteps. Pet parents are strongly encouraged to opt for longer subscription plans, preferably at least 6 months to enjoy discounts as well as a month’s worth of subscription and toy as added bonus. All items that are included in the gift box are sourced from credible and reputable organizations in the UK, Ireland, and the US to help guarantee quality and safety. Part of the sale goes to animal shelters and rescues that the company has partnerships with. This is good news for pet parents who want to make a difference in the lives of shelter dogs while providing their own with high-quality doggie surprises they will appreciate. Becoming a responsible pet parent is no easy task. 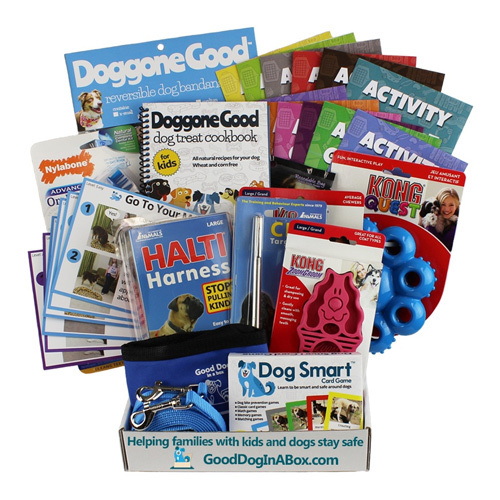 Good Dog in a Box provides you with an opportunity to hone your skills in making sure your pet will grow and mature into a better-rounded hound. Unlike other dog subscription services, Good Dog in a Box is more focused on giving you the right knowledge, skills, and attitude needed to become a better pet parent. The subscription program is composed of two components: the physical delivery of dog training and pet parenthood materials right to your doorstep and monthly access to online dog training and pet parenthood videos that you can easily watch using any mobile internet platform or even your desktop computer. The materials generally include lessons on dog training tools, exercises, fun activities, kid-friendly and pet-safe games, dog bite prevention courses, and responsible pet parenthood.